Is your iPad hurting you? iPad injuries and why a blackberry is giving us neck pain? We are all fairly aware of the dangers of poor workstation set up and overuse injuries in the workplace. The 80s and 90s saw a huge rise in technology in the work place and office-life as we know it dramatically changed. We became more sedentary in nature and began relying more and more on our computers and eventually email systems. Due to this inactivity and repetition of tasks there was a growth in the number of work place overuse injuries. Slowly we have developed ways of combating these injuries and most office workers are never far from an “Ergonomic workstation assessment”. However in these modern times we are becoming more and more reliant on our portable hand held technology. We have become more flexible with work hours and work locations. We have “hot desks” and love to “work form home”. We never leave home without our blackberry, or iphone and it’s not too uncommon to read your documents on the go on your laptop or ipad. So are we less likely now to get injuries from our workstations because we spend less time at them? The short answer in no. Enter the new age of work place injuries. Our ability to work anywhere has changed the playing field in terms of ergonomic workplace set up. Now “working from home” could mean sitting with a laptop on our knees on the sofa or lying in bed on our ipad. Are there new risks involved? Not really, it’s the same issues: Inability to maintain postural neutral, repetitive movements and single hand typing. Tablet computing on the ipad for example requires the user to hold the device with 1 hand while typing with the other. 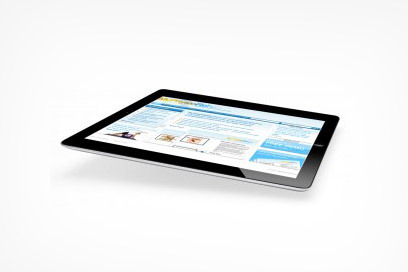 Placing the tablet on a table or your lap, requires even more neck flexion than using a laptop. 1) Minimizing time on portable devices is ideal and changing position frequently. 2) Use an external keyboard where possible and get the laptop or tablet off the lap and onto a stand on the table. 3) When using a blackberry, iphone or other smart phone for emailing, try to hold the phone up out in front of you to minimize the amount of neck flexion required to view the screen. 4) Zoom in to read text so you are not straining the eyes and encouraging “bending into the phone” to see the text. 5) When using a tablet switching holding arm frequently when reading will minimize strain in hand and arm. 6) Try to set your home workstation up the same way you would in the office. Here are some handy tips on workstation set up and basic exercises.